Bohn writes with verve and authority as he explores the foreign-policy practices of several presidents. Presidents strive to be wielders of bold and decisive foreign policies, yet circumstances beyond their control more often than not constrain their actions, resulting in temporary fixes rather than long-term successes. Michael Bohn, who served as director of the White House Situation Room under President Reagan, describes seventeen such challenges in Presidents In Crisis: Tough Decisions Inside the White House from Truman to Obama—illuminating how modern presidents have been bedeviled by such dangers as rivalries between civilians and the military; “groupthink,” which prevents a thorough analysis of each crisis; and the extent to which domestic issues drive foreign-policy making. 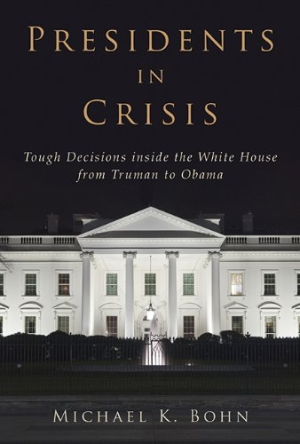 Each crisis is described in a several-page narrative followed by a brief assessment of the consequences of presidential actions. The most interesting theme repeated throughout is the importance of “muddling through.” Rather than avoiding foreign-policy ramifications, to muddle through, as the author defines, means that the president and his advisors carefully consider each action and work to a positive resolution through incremental steps. Bohn considers Kennedy’s handling of the Cuban Missile Crisis, George H. W. Bush’s response to the 1990 Iraqi invasion of Kuwait, and Nixon and Kissinger’s diplomacy during the 1973 Yom Kippur War successes. A significant failure was Eisenhower’s dissembling when a U-2 plane was shot down by the Soviets, which allowed a ranting Khrushchev to expose illegal American spying. Scholars and pundits will likely debate Bohn’s take on these and the other crises, but they are forewarned that they will be challenging a well-informed opponent. Arguably, the author’s most controversial assessments credit President Jimmy Carter for “muddling through” the 1979-81 Iranian Hostage Crisis, and his acknowledgment of President Obama’s incremental response to Syria’s use of chemical weapons in 2014. Bohn’s investigation is an important cautionary tale for all government officials and citizens who claim that foreign policy merely requires bluster and promises—usually unfulfilled.